Bhargava R. 2000. A preliminary survey of the western population of Finn's Weaver in Kumaon terai, Utttar Pradesh, Northern India. Oriental Bird Club Bulletin 32:21-29. Abstract. 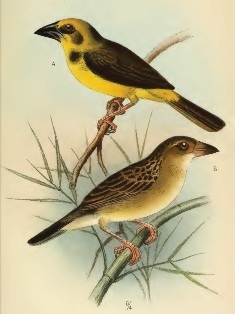 Of the four species of weaverbird found in the Indian subcontinent, the Finn's or Yellow Weaver Ploceus megarhynchus is the least known. The species occurs very locally in the lower terai from the plains to 1300 m. It is a globally threatened species and is listed by BirdLife International as Vulnerable. It was previously reported to be an endemic resident of India but has recently been reported from Nepal. A large breeding colony of Finn's Weaver was rediscovered in Kumaon terai in 1959 after two fruitless searches by Salim Ali in 1934 and again in 1954 with H. Alexander. This article presents the results of a survey for the species in Kumaon terai. The article provides a brief history of the Finn's Weaver, with the ecology, and historical and recent surveys. The author also describes the threats to this threatened species. The article is illustrated with some black and white photos, and colour photos of adults with the other Indin weaver species for comparison.